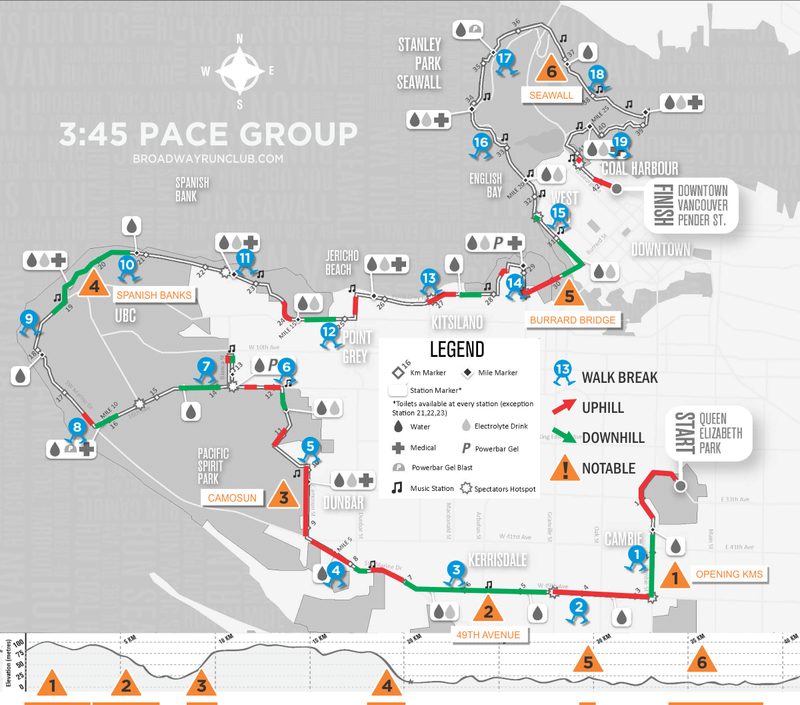 Running with the 3:45 Bunny at the 2013 BMO Vancouver Marathon? Here's all you need to know. Okay team, here’s the skinny. As your 3:45 Pace Bunny, I want you to know you’re in good hands, or paws, or whatever bunnies have. This is my race plan for Sunday including a modified version of the official course map that I put together with some notes for you to study over the next few days. For those of you not familiar with Running Room Pace Bunnies, we will be doing tens-and-ones, meaning we will run for ten minutes, then walk briskly for one minute, repeating the cycle until we finish. Please keep in mind that not everyone running around us will be doing walk breaks so when the time comes to walk, take care to shoulder-check to ensure you are not impeding other runners. To finish the marathon in 3:45 we will need to average 5:19 per kilometre. Adjusted for walk breaks, this means our running pace will be about 5:00 per kilometre. I am aiming for even first- and second-half splits so we should be hitting halfway in 1:52:30. I will be starting the interval timer on my watch as I cross the start line, not when the starting gun goes off, so hold off starting your own watch unless you don’t mind having your watch out of sync with mine. Based on my splits from the 3:45 Okanagan Marathon I paced last October, I have mapped out the approximate location of our walk breaks. 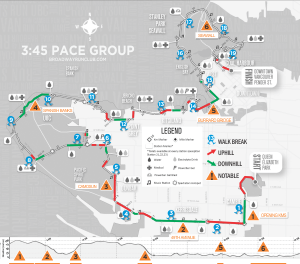 If the race works out according to plan, we will not be walking up the Camosun Street hill, down the Spanish Banks hill, or on Burrard Bridge. My preference is not to take a walk break on a significant downhill and it appears that we won’t have to. If you did the math earlier and figured out that 3:45 is 225 minutes and that 225 divided by (10 + 1) means we should be doing 20 walk breaks not 19, please note that we will be skipping the walk break in the final couple of kilometres. I may encourage those of you with lots left in the tank to take off and skip the final walk break after Brockton Point as well. On the map I have noted major and minor uphills and downhills to give you a sense of the terrain we’ll face on Sunday. The elevation profile on the marathon’s original map shows a few more bumps along the Seawall stretch than you’re bound to notice so consider everything from 32k to 41k flat. The Seawall does however snake around the fringes of the Stanley Park peninsula so what it lacks in vertical change it makes up for laterally. We’ll try to run those turns as straight as possible — this is called ‘running the tangent’ — but it may be difficult with a large pack on the narrow seawall path. 1. The Opening Kilometres – The first 4.5k of the race go either up or down. There is virtually no flat road so it can be difficult to settle into a rhythm early on in the race. Keep that in mind while your heart is racing and adrenaline is shooting through your veins. Exercise caution early on. 2. West 49th Avenue – Around the time you cross Granville Street, 49th goes steadily downhill for about 2.5k. You’ve made it through the up-down-up opening section and cruising down 49th, you’re convinced you’ve found your rhythm which you’re happy to see is below your expected race pace. I’m convinced this was my downfall in the 2012 race. Enjoy the downhill but again, exercise caution. It can beat up your quads more than you realize. 3. Camosun Hill – The one hill in Vancouver I never expected to see as part of a race course, this beast is just over a kilometre long and takes you in a straight line steadily up Camosun Street past Southlands School where 41st Avenue becomes SW Marine Drive to St. George’s School at 29th Avenue. The good news is the city has repaved Camosun since last year. The bad news… well, among other things, when you’re at the bottom you can’t see the top. 4. Spanish Banks Hill – The steepest, significantly downhill section on the course begins with a left turn on NW Marine Drive just after the Chan Centre. The descent actually starts at the Museum of Anthropology but really plunges after the turn and then bottoms out just before the halfway point of the race at the western end of Spanish Banks Beach. Just as notable as the drop in elevation is the spectacular view of the North Shore which you first see on your way down the hill. With few exceptions, views like this continue for the rest of the race. Be sure to look up often and soak it in. 5. Burrard Bridge – The climb up the bridge isn’t particularly challenging, but reaching the bridge, at the 30k mark of the race, should be your signal that it’s time to get down to business. From the high point of the bridge, there’s about a kilometre of steady downhill to give you a little push to ease you into the final stretch around the Seawall to the finish. 6. The Seawall – Starting just after English Bay Beach around 32.5k, there’s a lot that’s notable about the Stanley Park Seawall, including the fact that it is probably the most iconic running location in Vancouver. As I mentioned earlier, the Seawall is flat and normally fast, but depending on how you ran the first half, your dead quads may not allow you to capitalize on that. The Seawall is also exposed and there is a chance of stiff breezes blowing especially along the northeast side. With Sunday’s warm weather forecast, we may welcome the breeze even if it makes us work a little harder to maintain pace. Sunday should be a lot of fun and since we’ll be spending a lot of time together I want the experience to be as enjoyable for everyone as possible. Don’t overdress. Bring gels or whatever your fuel of choice is. There are gel stations but you don’t want to be stuck if they run out before we get there. There are water stations every mile so carrying bottles is not necessary unless you need something more than water and can’t stand Gatorade. If you want to wear an iPod, go for it but pay attention to other members of the pace group. If you want to provide your own music and sing out loud, please do if it’s something we can all sing along to. If you want to talk about the election, be prepared for the pace to drop to 4:00 kilometres — politics has that effect on me. Rest up everyone and I’ll see you Sunday morning! I would agree with you that you definitely need to be cautious on the downhills and not go out to fast on this course. Also, I found the seawall is a beautiful part of the course, but mentally challenging as you always expect to see the next landmark around each bend… It just seems endless. Thanks Robert! Indeed, the winding Seawall can seem to go on forever as each turn often resembles the one before it. The randomly-placed kilometre markers last year added an extra degree of difficulty to what should have been, on paper at least, the easiest part of the race. Hey Robert, I just noticed that I’m running right beside you in one of your pics from last year’s race – obviously that was early on! This year hopefully I’ll “run smart and finish strong”, but maybe include a bit of “go big or go home” too! Awesome plan Dave! Looking forward to seeing you on Sunday.